Many people have the misconception that the porcelain tiles are different from the ceramic tiles. However in reality, porcelain tiles are a type of ceramic tiles which are mostly used for flooring and walling purposes with an absorption rate of around 0.5%. The only difference is that the ceramic tiles are made of clay. water and sand while the porcelain tiles constitutes of clay which is more dense. These tiles are formed by the application of heat and pressure which makes the porcelain tile more hard and dense than ceramic tiles. Both of them constitute clay and other natural materials, however the clay used to make a porcelain tile is more pure. You can be more flexible in terms of design when using porcelain tiles. A disadvantage is that these tiles can’t be replaced in a corner if they are chipped because of the distinct colour difference and therefore one should be careful while cutting porcelain tile and installing it. One can use a few different ways to cut a porcelain tile starting from a regular tile nipper to the expensive tile cutter. The method used for each of the tools is different and therefore, shall be done with proper guidance. These methods are convenient, faster and easier to carry on and are relatively less costly when compared with the wet saw. Tile nippers are excellent for cutting arcs or circular section of tiles which is difficult to do using a wet tile saw. They are also great for making regular cuts. 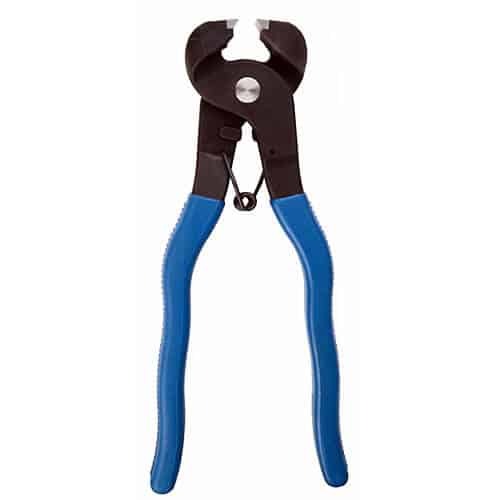 In the construction industry, we see a lot of people using tile nippers in huge amount. This is because of the ease of their functionality and also because most of us are only interested in cutting a small piece off the tile. 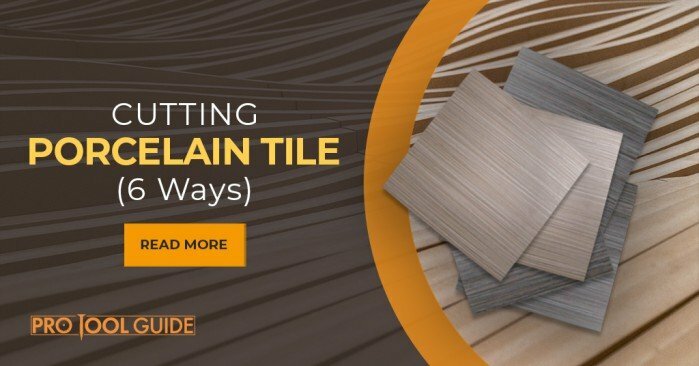 Initially, take the tile that you want to cut and prepare it. Then, score a line marking the edge where you want to make a cut with a cutter. Use the tile nipper, hold it at the edge centre of the marked line and apply pressure. The nipper will break the piece off. Take small nips and go slow as sometimes the piece fails to nip off, and that’s when you should try cutting it with a cutter. Don’t stress your nipper so much that it might even give up. After nipping is completed, use a rub brick to smoothen the edges and the cut itself. The edges will be sharp so be cautious when doing so. The best tile nippers that are found in the contemporary market are Qep and Kobalt. ﻿ I would recommend you to use tile nippers only to cut curvy and circular areas. For straight and angled cuts, use a wet tile saw. Also, a good idea today would be to use the new generation tile nipper with replaceable teeth. The old ones can break due to the hardness of porcelain tiles made today. The second best tool that can be used is an angle grinder which can do multiple cuts in different sizes and shapes including the L cuts, the circle cuts, straight cuts, square cuts etc. Cutting porcelain tiles around the toilet for pipes and exposing waste needs a curvy cut rather than drilling holes. An angle grinder is perfectly suited to cutting curves in tiles. On the tile, mark out the shape which is to be cut and have a clear idea about which side is the waste. You can get carried away easily and score on the side of the tile. Use an electrician’s tape to make a cross as a marker. Mark the desired shape on both sides of the tile. Make sure you follow the shape on the edge of the angle grinder gently with little pressure to get a clean mark which doesn’t chip. Make multiple small cuts by turning over the tile. These will avoid the jamming and help you maintain control. The blade should run into the waste side. After you get the desired cut, you can smoothen the edge by using an abrasive wheel. The finished cut will depend on whether the cut is clearly visible on the (polished/unpolished) porcelain tile. Just take the grinder and pull it across the edge that you want to cut and the grinder does the work for you in no time with efficiency and cleanliness. A tile cutter is used to cut ceramic tiles upto a desired size and shape. However, depending upon the type of texture, you can even cut certain porcelain tiles using a standard manual tile cutter. It is favourite among the woodworkers because it is the fast among all the cutting tools and you can make many adjustments to the type of cuts you want to make depending on the tile type and size. All you need to do is to cut the tile just the way you cut the paper with a paper cutter and rub the edge with the sandstone for a smoother finish. It will break into two smooth pieces. Smoothen out the edges to reduce sharpness. Watch this video to get a practical idea of how to cut a porcelain tile using a tile cutter in the safest way. A wet tile saw cuts tiles made of ceramic and porcelain leaving a clean, smooth edge. As mentioned, owning a wet saw is not economically feasible. However, you might as well come across certain situations where you need to weigh the pros and cons and use a wet saw for cutting a porcelain tile. It is the best way to cut a porcelain tile in my honest opinion. Although they can chip the surface of porcelain tiles so in order to ensure a cleaner cut, you should use a wet saw with an adjustable blade. Working slowly and using a fresh blade always helps. This is why one should know how to cut a porcelain tile with a wet saw, a cutting machine or a blade. It is mandatory to mark the cutting line with a wax pencil before you start cutting porcelain tile. This is to ensure the precision in the size and the chipping can be avoided by masking the edges with a suitable tape. After marking the edges, take a cutter and score the line to make the clean cuts. Be sure that the tile is levelled along the blade to avoid any distortions or bends. Now, apply pressure and score the tile towards the down for it to snap. Once cut, you can either continue to the final cut or notch the tile before that. A wet wheel also known as a diamond blade is used to cut very tough and coarse materials. There are diamonds fixed on the edge of the blade which facilitates this action. The tiles and stones can usually be cut with two type of wet machines one being using the tile saw and other using a wet wheel. In one, the blade which is overhanging moves along the surface of the tile and in other the tile is moved along the cutting blade (rotating). Before making the cut, make sure that you have side support to the tile. If not, you can try making a support out of plywood for tiles which are larger than 600mm side. Align the edge with the help of the cutting wheel and guide it smoothly over the blade till the cut is complete. Applying force may cause chipping. When you are dealing with circular cross-sections, drill bits come handy while creating clean holes to fit the screws properly inside them. They are available in many different sizes and shapes and work on various kind of materials. Drilling holes are same as making cuts in a porcelain tile only in smaller scale and in circular shapes. However, drilling is not easy, and you want a clean drilled hole in the tile so that it can fit the screws, plumbing pipes, space for radiators et. al. Mark the exact position where the hole is to be drilled and cover it with a thick tape to prevent the chips and helps in drilling smoothly. An starting drill hole might be needed as a support if you wish to drill larger holes. In order to prevent torque with the sudden shifts of the tile, fix the tile properly before hand. Start drilling very slowly to cut a hole without overheating as it may cause it to stick. Though some of the tools mentioned above like the wet saw and the drill bit are not very safe to use because of their potential for accidental hazards. Porcelain tiles when cut, smoothened and installed is a lifetime investment regarding functionality, beauty and also aesthetics. Therefore, try the method from the above noted that suits your purpose the best and get to work with it. After reading this guide, I am pretty sure any of you can easily cut porcelain tiles with good accuracy. If you have any questions or doubts, feel free to comment below. Share this guide if you liked it, it would mean the world to me. Keep visiting for more such content! Is there a tool made for bullnosing porcelain. I would like to use some 20mm size porcelain tiles around the edge of a swimming pool. To make the edge safe is there a tool that can be used for bullnosing it. I’m considering porcelain tiling the walls of a swimming pool. What are your thoughts on this? I’m shipping in some specialized tile from India for this purpose. You can use an angle grinder with a diamond blade or a wet-saw with an adjustable table. Either method is going to be pretty time consuming as you are going to have to grind over 1000 20 mm tiles !